- Wildlife Photojournalism, full story below. 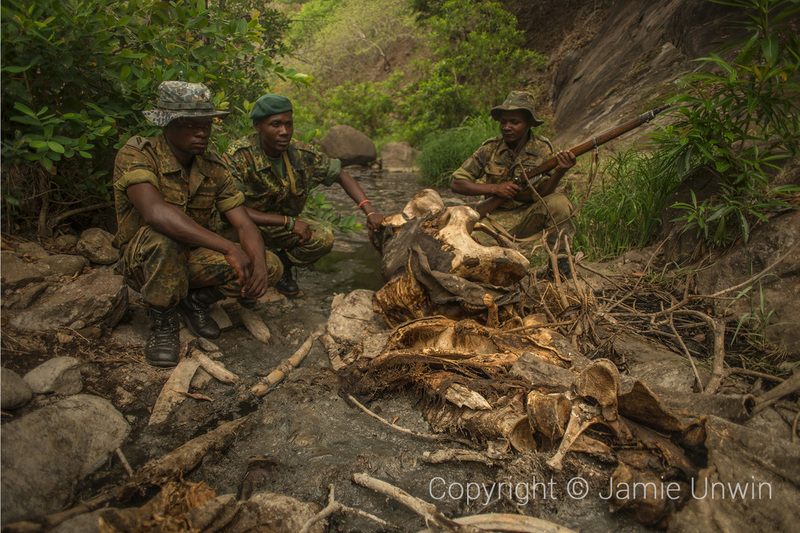 An example of Malawi’s ‘boots on the ground’ and their tireless efforts to protect the last forest elephants in Thuma Reserve. At first glance it is a sad scene, the carcass of an African elephant lies decaying in a stream, so rank the Hyenas have left it be. This elephant had been shot by Dixon Mzimba, a serial poacher and native Malawian who was known to have killed at least three elephants prior to the one seen here and was selling the tusks on to the Asian syndicates. However Dixon Mzimba could not outsmart the newly trained anti-poaching team who proudly told their story of how they tracked him down and arrested him. Dixon is now facing a four year jail sentence with hard labour for hunting elephants. The charge for killing the elephant and attempted ivory trafficking is pending and will likely add many years to his sentence. Malawi has recently been ranked as the poorest country in the world which has often put short term human survival issues over those of wildlife and the environment, and corruption is also rampant as shown by the Cashgate scandal. However there are some individuals who genuinely care about wildlife and take pride in their job whom should be celebrated. There are always those who are passionate for what they care about. Three scouts, Richard Banda, Felix Banda, and Mathews Banda put their lives on the line to protect wildlife. 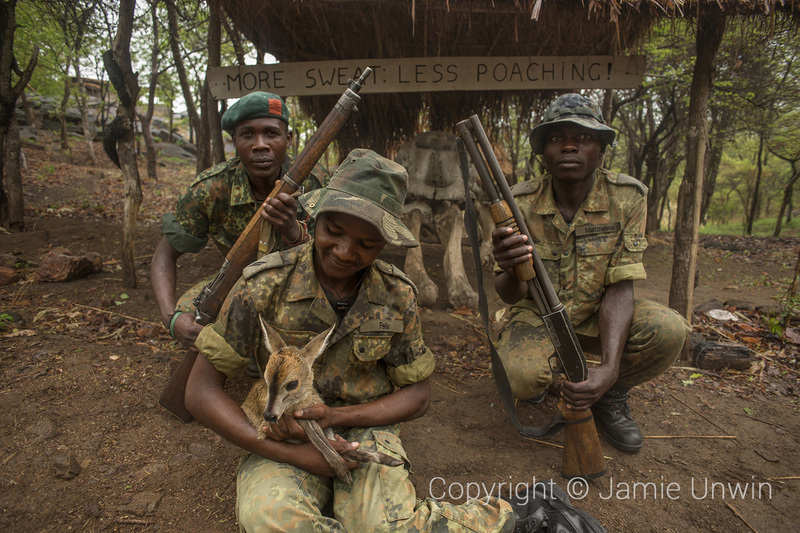 Felix cradles a baby Duiker which the brothers rescued and raised after its mother was killed by poachers. ​It is not just the elephants at risk, Malawi also boasts the 5th highest deforestation rate in the world. 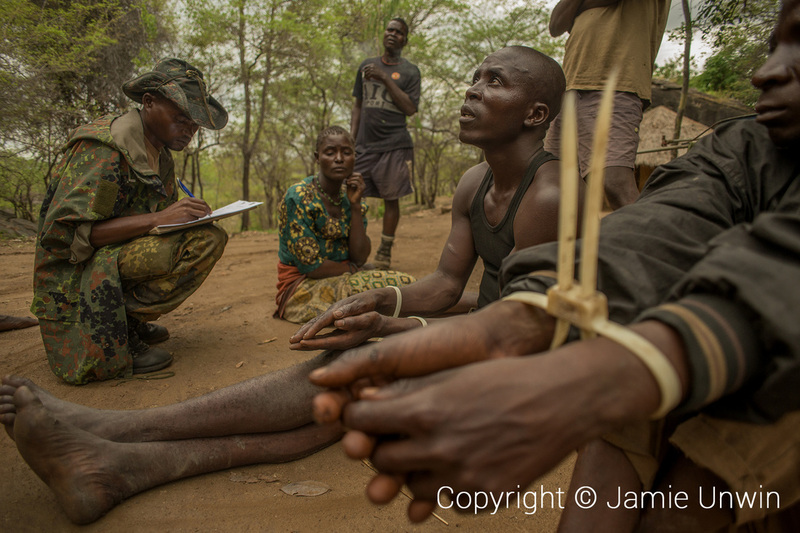 It is up to the scouts to protect their forest and that means cracking down on the charcoal traders. Here wildlife scouts have arrested three people after an overnight mission including a gruelling ascent up a mountainous ridge to an area where they had noticed the tell-tale smoke. 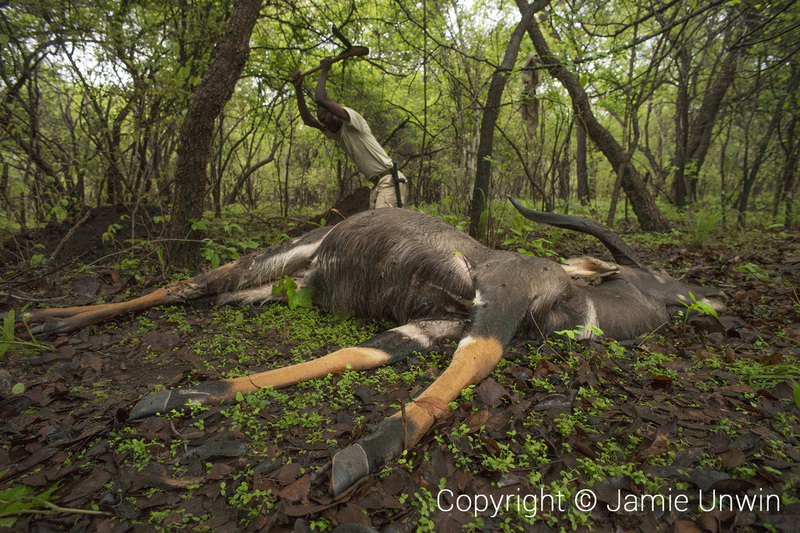 Mauled to death by poachers’ dogs, a wildlife scout at Kuti reserve berries the Nyala before its poacher can locate the carcass and harvest it for meat. Its being berried as a statement to the people of Malawi that they need to understand that it’s a criminal offence to poach, poverty and hunger are no longer tolerated as excuses to poach. 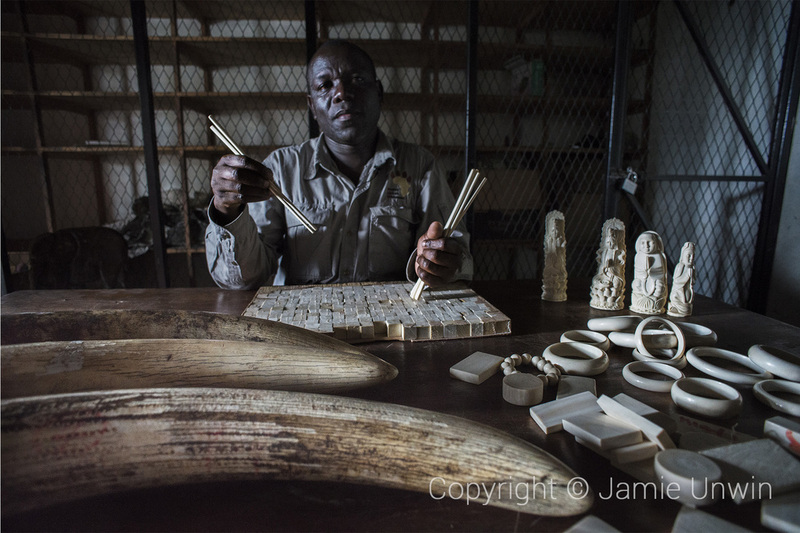 Malawi is making a stand against wildlife crime whatever the reason. A great tusker, elephants with tusks so large they would reach to the ground, and beingdriven to extinction in Malawi. 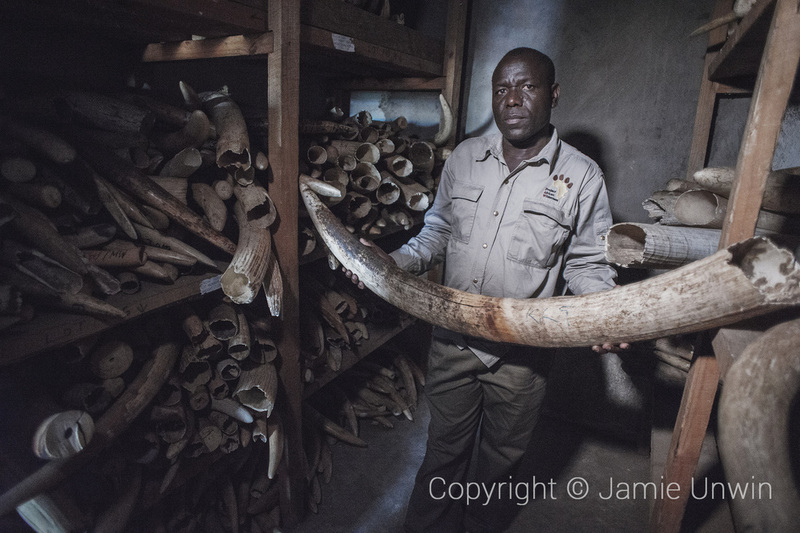 The number of elephant tusks in this single Government stock pile room equal if not exceed the remaining elephants in Malawi. At time of writing the President is deciding whether to give the go ahead for a burn of the country’s ivory stockpile, I hope to update this description concluding that the Ivory this official is surrounded by no longer exists.